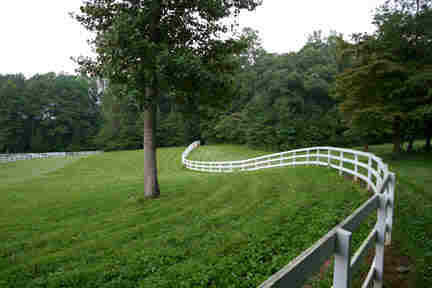 Applewood Farm web page -- Tour of Farm, Horse Farm, Boarding, Instruction, Dressage. Aerial view of Applewood May 9, 2003. Facility and grounds graphical tour map. Stables -- 20 stalls with rubber mats, tack room with tack closets, observation deck, wash rack, cross ties, automatic watering systems, fly spray system, cool down misting fans & radiant heat. Outdoor Arena -- Our outdoor arena has a 20x60 meter dressage arena with a 5 meter warm up track. An all weather design, the base incorporates a percolation system for self drainage over the whole surface. Excellent full view mirrors extend the full width at C. The footing is Precision EQ shredded rubber and sand mixture. Click Here for plans and information on the arena design or rubber footing, visit the arena construction slideshow. Click on the slide show to see a step by step presentation on how to build an excellent self draining arena for your self. Covered Arena -- Precision EQ rubber and sand footing. 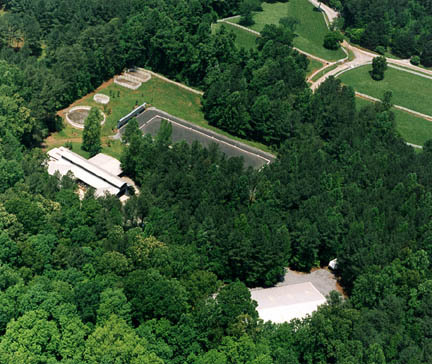 Surrounded by trees, it is isolated from activity and stays cool in the summer. Lighted for night riding. Pastures -- 10 acres grassed with a blend of Coastal Bermuda, Kentucky fescue, Ryegrass, and Red Clover stay green and provide grazing all year. 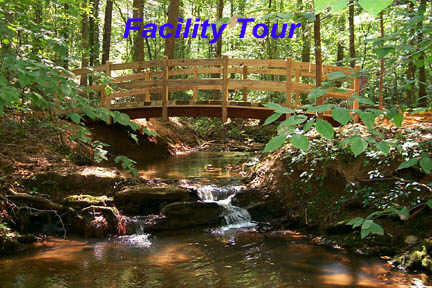 Riding Trails -- About a mile of wooded trails go around the property and include a small stream crossing. To view Boarding Rates, go HERE.